What a fun stocking stuffer or kid's holiday gift the new DreamWorks Turbo Blu-ray DVD combo from Twentieth Century Fox Home Entertainment makes. Just released last month, this animated feature originally appeared on the big screen in theaters. Now kids and adults can enjoy non-stop family-friendly entertainment on the racetrack from start to finish at home. Turbo is from the same creators as the blockbuster films Madagascar and Kung Fu Panda, so you can expect this to be in the same league. It features an impressive voice cast, too, including well-known star talents like Ryan Ryan Reynolds, Paul Giamatti, Michael Peña, Snoop Dogg, Maya Rudolf, Michelle Rodriguez and Samuel L. Jackson. The story revolves around Turbo, an underdog snail who befriends a group of savvy street snails and some people. Together, they team up to take on the biggest challenge any of them have ever encountered. 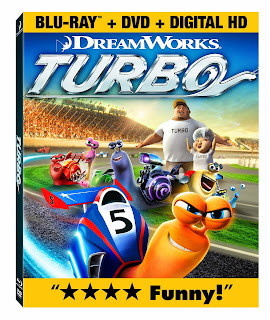 The Blu-ray + DVD + Digital HD edition offers lots of options such as watching Turbo in High Def. With product purchase you can instantly stream and download the Digital Copy and then watch it on a TV, computer, tablet or smartphone. For hours of enjoyment, beyond just watching the movie itself, there are also a generous amount of extras. These include The Race Storyboard Sequence, Shell Creator Game, my favorite extra World of DreamWorks Animation, and more. Approximate total run time is 96 minutes. Want to know how fast is fast? This DreamWorks Turbo clip show you! In this video you'll see the fastest and slowest animals on Earth compared -- including Turbo. Watch actual footage of real animals and animated text graphics that make this both fun and educational. Here are some fun and free activities to download, all based on the movie, to enjoy with your child at home. 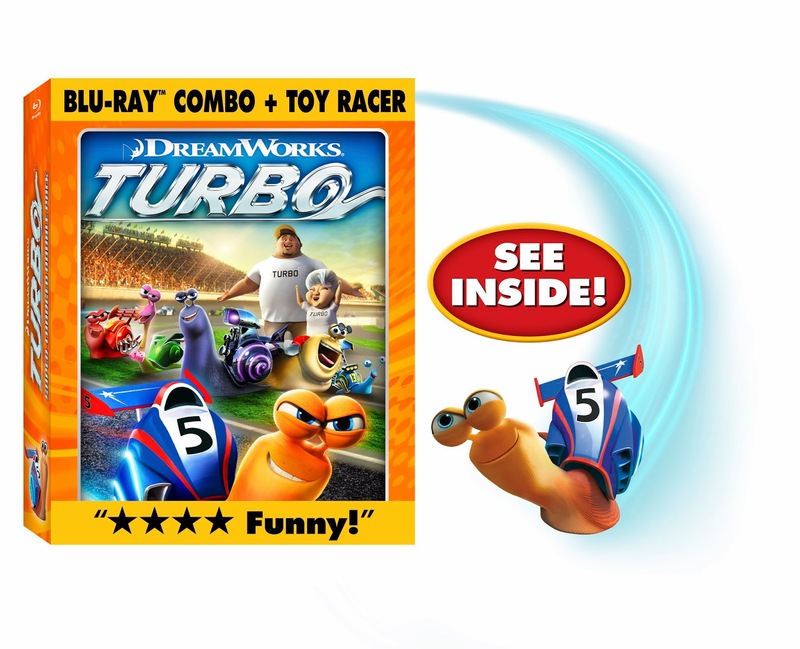 The Turbo Blu-ray DVD + Digital HD combo has a list price of $38.99 while the Turbo Blu-ray + DVD +Digital HD with Toy Racer also retails for $38.99. Both new home entertainment releases are widely available online and instore. Thanks to Fox Home Entertainment, one lucky MommyBlogExpert reader will take home this DreamWorks Turbo Blu-ray +DVD + Digital HD combo. FTC Disclosure: This is a sponsored post. I disclose that I am a Fox Home Entertainment Insider brand ambassador. I received the Blu-ray DVD featured to facilitate this movie review and the associated giveaway post. Fox is providing the free downloadables included in this post as well as the prize and shipping for the giveaway. However no payment was received and opinions here are my own. See complete FTC Disclosure information that appears at the bottom of MommyBlogExpert's main page and at the bottom of every individual post on this blog, including this one.